Dissolve the yeast in the lukewarm water. Stir until yeast is well combined, about 1minute. Some lumps may remain. To a mixing bowl add the salt, sugar and melted butter, and the yeast mixture. Stir until combined. Slowly add in 3 cups of flour, 1 cup at a time. Mix by hand or use mixer fitted with dough hook, until dough is thick. Add 3/4 cup more flour and stir. If dough is still sticky, add flour, and additional 1/4 cup at a time, until no longer sticky, and dough bounces back when poked with your finger. Turn the dough out onto a lightly floured surface. Knead for about 3 minutes and shape into a ball. Place in a large mixing bowl that has been lightly coated with nonstick spray. Cover and let the rest in a warm area for approximately 10 minutes. Preheat oven to 425°F. Line two large baking sheets with parchment paper or silicone baking mats. Section dough into six equal parts and roll each section into 20-inch long ropes. Cut each rope into 1-1/2 inch bites. Bring 9 cups of water to a boil with the baking soda. 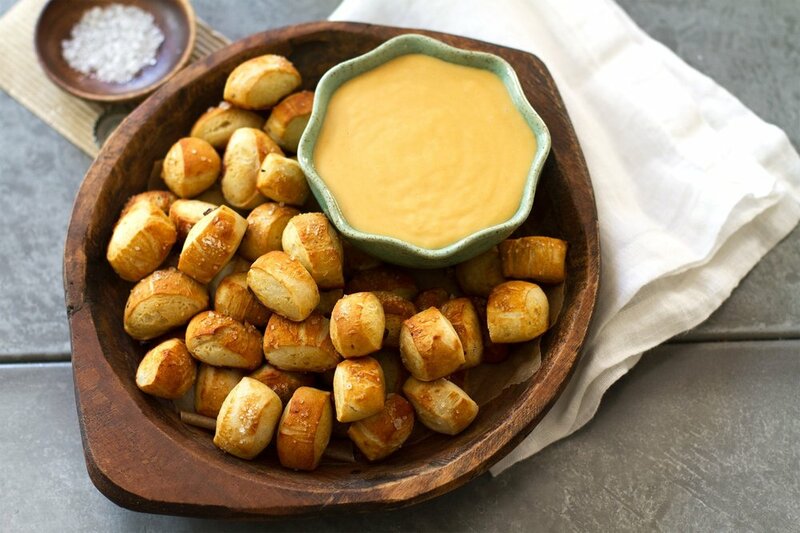 Once rapidly boiling, drop 8-10 pretzel bites into water and let sit for 20 seconds. Brush beaten egg over each pretzel bite and sprinkle with salt. Bake for 10-15 minutes, until golden brown, rotating the sheet pans once halfway through cooking. Remove with a slotted spoon and place onto the lined baking sheet, making sure that pretzel bites do not touch. If you are piping the pretzel bites now is the time to fill your pastry pouch with above ingredients and fill each pretzel bite with one push of mix then line them without touching bake on baking sheet. 1. Heat the milk in a small saucepan over medium heat until small bubbles form on the top. 2.Meanwhile, melt the butter in another saucepan over medium heat. Sprinkle the flour over the top, and whisk until lightly browned, and thickened, 2-3 minutes. 3. Slowly add the warm milk to the flour butter mixture in a steady stream, whisking constantly. Continue cooking, whisking constantly until the mixture thickens, about 5 minutes. It should be thick but still pourable. Add the Batch Brewing Co pouch, whisking constantly until it is melted.